For many years the MANUALplus has been proving itself in daily use on cycle lathes and is characterized particularly by convenient manual machine operation. Application-oriented cycle programming enables the machinist to create and edit programs rapidly and efficiently on the lathe. The MANUALplus 620 is designed for lathes with spindle, one slide (X and Z axis), C axis or positionable spindle and driven tool. It is suited for horizontal and vertical lathes with simple tool holders or with tool turrets. Cycle lathes are usually used for smaller and mid-size production batches. The operator of a MANUALplus 620 profits from the quickly learned cycle programming, with which workpieces can be machined quickly and efficiently. And when requirements increase and you machine complex tasks with your lathe, you then create your NC programs with the new smartTurn programming mode. 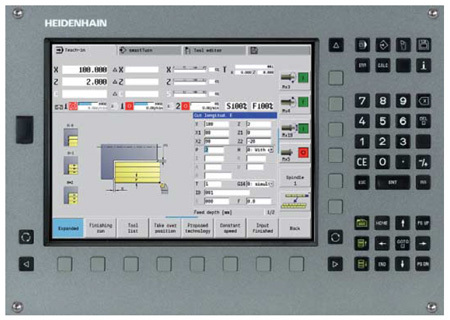 The smartTurn programming mode of operation is the basis for NC programming on CNC lathes. This new type of NC programming is also mastered quickly, since the machinist does not have to deal with G or M functions, or with structuring a machining block. smartTurn uses the easy-to-learn form entry method of programming.